Veterans talks at Belmont University Nashville, Tennessee, February 27, 2018. 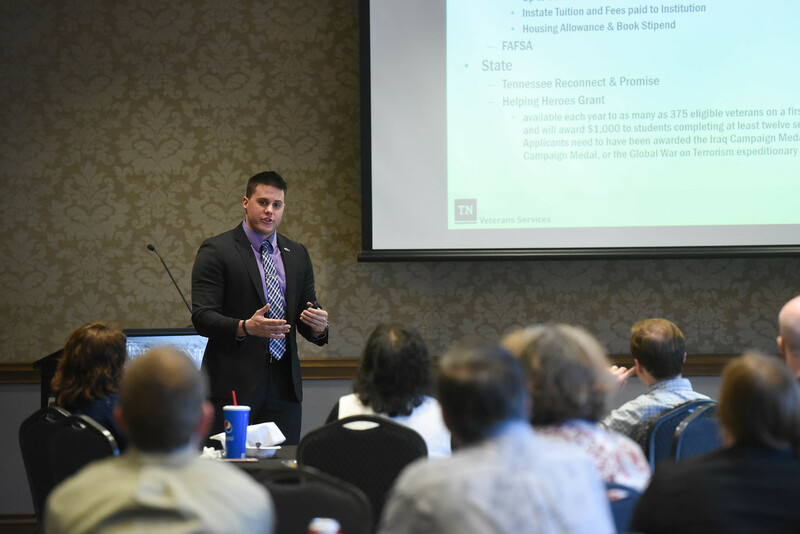 Belmont University’s Veteran Success Team recently hosted two Veteran Empowerment Training sessions for faculty and staff across campus. Since the Post-9/11 GI Bill, which provides additional opportunities for veterans to earn a college degree, campuses across the country have seen a dramatic influx of veterans seeking educational opportunities. Belmont’s student population has been no different. Because the process of transitioning from military to civilian life can pose challengers for all service members, veterans and their families, the University’s Veteran Success Team, part of Interdisciplinary Studies and Global Education, continues to provide support to this campus group. As Belmont’s veteran population has grown to more than 155 undergraduate and graduate student veterans, the Team understands the importance of ensuring faculty and staff are fully equipped to serve student veterans. The Veteran Success Team works to ensure student veterans are welcomed and equipped for success at Belmont. They provide help with academic resources, transitioning to campus life and career readiness. Their efforts were recently recognized, as Belmont was ranked No. 3 in the South for Best Colleges for Veterans on U.S. News & World Report’s 2018 edition of America’s Best Colleges.